Water is the main component of our body. Adequate water consumption plays an important role in maintaining a healthy body. Experts recommended drinking at least eight to ten glasses of water each day to maintain good health. Water helps to keep our body well hydrated, which is essential because every cell in our body need water to function properly. Health scientists found that most of the common health problems are the consequences of acidic physique, therefore Diamond Coral Alkaline Water provides minerals that give our body needs and thus reduce health problems caused by acidic physique. To enhance the health of my family, Mommy Jane had recently installed Diamond Coral Alkaline Water at home. Diamond Coral Alkaline Water with ph value of 7.5-8.5 contains calcium and magnesium ions, which can revitalise our skin and health. By improving penetration power of water in our skin up to 200%, it gave us a healthier look, more vibrant and a smoother skin. It also helps to rejuvenates our body. That is the reason why Mommy Jane bought a spray bottle and fill it up with Diamond Coral Alkaline Water. Every morning, my Little Angel will fill up the bottle to spray it everyday. It helps to make them feel fresher and improve their skin condition. Whenever they feel hot, they will spray the alkaline water at their face. By moistening our skin with Diamond Coral Alkaline Water, allergies problems that caused by redness and dirt in the air can be relieved. Whenever my Little Angels had allergies problems or mosquito bites, the Diamond Coral Alkaline Water could relieved the itchy feeling. As for Mommy Jane, using Diamond Coral Alkaline Water as a medium of make-up removal works better than tap water. Every night Mommy Jane will use Diamond Coral Alkaline Water as a well-balanced mask for about 5-10 minutes to moisturise my skin up to 200% leaving my skin more radiant after washing. My Little Angels love to drink Diamond Coral Alkaline Water as it has a tinge of sweetness with no bloating side effects. It is rich in minerals and trace elements, contains sweet taste and high penetration power and it is easier to be absorbed after magnetisation. It creates wonders in making a variety of beverages and you'll surprise with its impressive performance. Mommy Jane loves to soak fruits and vegetables with Diamond Coral Alkaline Water coz' it can helps to preserve its freshness. 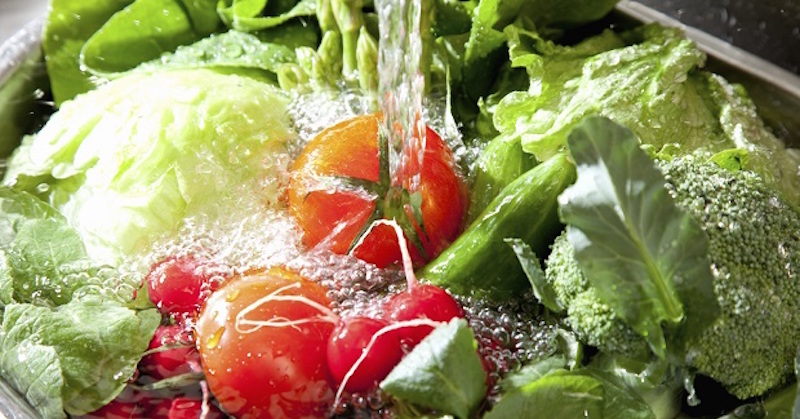 It also can remove up to 99% of toxic agricultural chemicals and pesticides from fruits and vegetables after is has been submerged for over 30 minutes. Soak our vegetables with the water will reduce the sourness and preserve its freshness and sweet taste. To prevent oxidation for apples and pears, soak them with the water before cutting. Even those strong unpleasant odour of seafood such as fish, shrimp and shellfish can be removed by rinsing it with the Diamond Coral Alkaline Water. Rice will be more aromatic and softer and Noodles are tastier and more springy in cooking. For warm or hot water, Mommy Jane and Little Angels drink the Diamond Coral Alkaline Water at the Diamond Coral WaterBar with 3-Second Instant Heat Technology. Traditional water dispensers that our parents use in those days had lots of harmful chemicals such as manganese and nitrite with 24 hours repetitive reheating function. If we did not clean up the dispenser inside, these harmful chemicals will accumulate and long term consumption of those reboiled water may put our family health at risk. To keep away the unhealthy re-boiled water, Mommy Jane had choose to install the Diamond Coral WaterBar. It has 3-second instant heat technology and has replaced the traditional heat components in the dispenser. Diamond Coral WaterBar increases the boiling rate up to 100 times and heats up water in just 3 seconds. All you have to do is to press a button, everyone in the family could enjoy fresh hot water within 3 seconds. This new device not only shortens the boiling time of water but avoid reboiling to release such harmful chemicals. It is very easy to use. Even my youngest at 4+ now will take his own warm water to drink it daily instead of mix it by themselves. It had improve his health a lot. The warm water from the Diamond Coral WaterBar had strengthen our body defense and help to guard ourselves over the thread of disease. If you want to experience the benefits of the innovative of Diamond Coral WaterBar with 3-Second Instant Heat Technology, do visit Diamond Free Trial Website at http://diamondcoral.com/my/a-good-baby-milk-helper-for-new-mom-dad and their specialist will deliver the Diamond Coral WaterBar to your preferred location. For Free Trial Diamond Coral Alkaline Water 60 days, do check this out at http://diamondcoral.com/my/coral-alkaline-wate r-60-days-free-trial-plan/. You can also get Diamond Coral WaterBar for 7 days free experience. Do check out more details about Diamond Coral Alkaline Water at their website at www.diamondcoral.com or facebook page at www.facebook.com/DiamondRefined. After using and drinking with Diamond Coral WaterBar for 2 weeks, me and my Little Angels felt healthier now. Our skin had improved so much and I do feel younger now. Where ever we go, we will bring along a small bottle to spray at our skin to maintain the moisture and makes us fresher and of course a big big bottle so that we can have it daily. Drinking warm water is easier now with the 3-second instant heat technology from the Diamond Coral WaterBar. Instead of our usual 7 cups of water daily, with Diamond Coral WaterBar, we had increase it to 9-10 cups daily. Do try it now and feel the different. Didn't know there are so much benefits to Alkaline water! Especially can be used as a mist spray and also face mask. Thanks for sharing! Have heard of alkaline water machine. A friend bought for more than RM10K! How much is this? Emily, if you trade in your old one, will get some rebate to buy a new Diamond Coral Alkaline Water. Arisa, do try it out. Good for our skin. wah bestnya alkaline water ni...mesti mahal kan..
Lina, they had trade in your old filter to buy a new Diamond Coral Alkaline Water. You can check this out with their sales team. Miera, just trade in your old one to reduce the price of this Diamond Coral Water. It will helps you to save more. Thanks for sharing. Menarik sangat alkaline water ni. Afizah, you're most welcome. You can ask for free trial too. Hasif, you can ask for free trial to try it out.